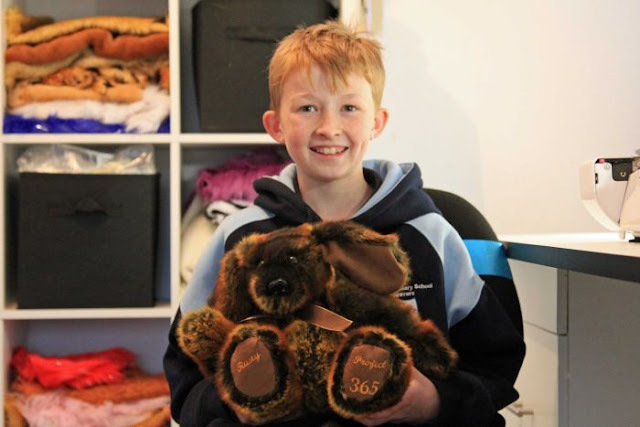 For the last three years, Campbell has spent all of his free time sewing teddy bears for charity. 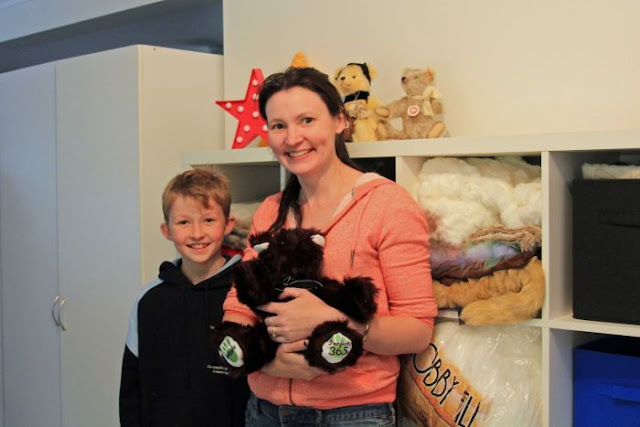 "I do comfort bears, which are for parents if their kids are in hospital having a hard time," he said. "I do overseas bears, like for terrorists attacks. "I sent one over to Paris when the people got hurt, and I'm sending some over to Brussels too. "Self-taught teddy bear maker. This charitable obsession started when Campbell decided he wanted to give Christmas presents to children in hospital. "He asked if we could buy presents for children in hospital and I said 'No way, dude'," Sonya Whittaker, Campbell's mum, said. Ms Whittaker said she told Campbell that with nine children of their own, buying presents for sick kids would just cost too much. "He said 'No worries, I'll make them then'," she said. "OK, [I said] go for gold, knock yourself out. "Ms Whittaker said Campbell made six or so toys in a couple of days and then came to her with a pattern to make a teddy bear. "He brought me this pattern and said 'Mum, I can't work this out. Can you have a look for me?' I'm like 'Nah, it's beyond me'," Ms Whittaker said. She sent Campbell to bed, thinking that would be the end of it.A few hours later, he came back with his first bear. "He came down with this funky looking teddy bear that he'd made ... it was incredible," Ms Whittaker said. "He's just sewn and sewn since then. "Campbell has pushed himself for the past two years to create a teddy bear a day. Surprise from online family Ms Whittaker has since set up a Facebook group called Project 365 by Campbell to track her son's progress.One of the group's members, Kat, was recently inspired to help Campbell. "I sent his mum a message one night to ask if he needed fabric," Kat said. "She came back with a definite no, but [she said] what he did need was storage space. "I set up a [online fundraiser] that night with the aim of reaching $1,000 in a week or so and we reached $1,000 in 36 hours." Kat used the money to buy Campbell a work bench and storage space to hold all the donated fabric he has. 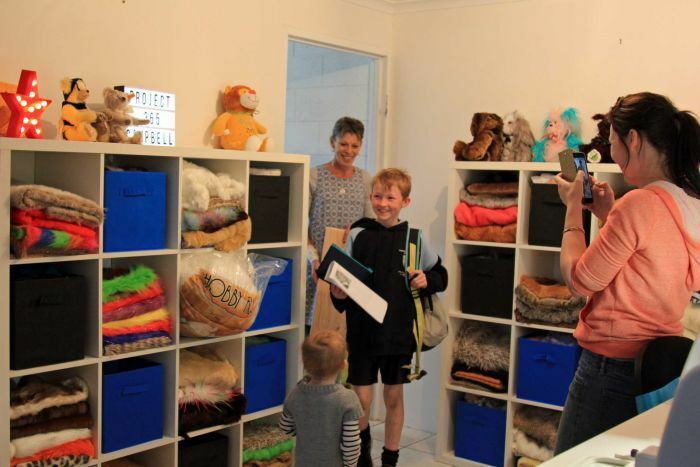 A team of volunteers set to work while Campbell was at school to transform his bedroom into a sewing room. Kat said she wanted to help Campbell in some way to say thank you for all the work he had done. "He's such a selfless little boy," she said. "He does it all off his own back with his pocket money and donations from other people, but asks for nothing in return. Ms Whittaker said she often thought about what would have happened if she had said no when Campbell first asked to use her sewing machine. "Look at the last three years of experience and practice and skill he's got ... look at what the word 'yes' has done," she said. "Just one simple 'Yep, knock yourself out' — and he has."